Bracelets & Bangles	There are 80 products. Shore cascade sandblast 7.5 inch bracelet from Kit Heath&apos;s Coast Collection, measuring 2.5 x 22mm. Kit Heath jewellery is made in solid sterling silver and each piece is rhodium plated to prevent tarnishing and ensure long lasting beauty. Supplied in a deluxe Kit Heath presentation box. 9ct rose gold fine twisted curb link bracelet, fine rope-twisted fancy curb links with a lobster clasp. Width 2.3mm, length 7.5 inches. Weight approximately 0.8 grams. 9ct yellow, white and rose gold fancy link bracelet, three rows of three-coloured fancy twisted oval links, with lobster clasp. Width 2.1mm, length 7.5 inches. Weight approximately 1.6 grams. 9ct yellow gold three-row brick link bracelet, hollow oval links with plain polished finish and a lobster clasp. Width 9mm, length 8 inches. Weight approximately 9.4 grams. 9ct yellow gold broad Bismark link bracelet, six rows of fancy open links, with polished finish and trigger clasp. Width 9mm, depth 7.5 inches. Weight approximately 5.4 grams. 9ct yellow and white gold bracelet, hexagonal and cross-over hollow links, with plain polished and diamond cut finish and trigger clasp. Width 8mm, length 7.5 inches. Weight approximately 6.1 grams. 9ct yellow and white gold bracelet, hexagonal and cross-over hollow links, with a polished and diamond cut finish and trigger clasp. Width 7mm, length 7.5 inches. Weight approximately 4.9 grams. 9ct yellow and white gold fancy chevron link bracelet, two diagonally off-set rows of shaped rectangular hollow links, with a polished and diamond cut finish and trigger clasp. Width 9mm, length 7.5 inches. Weight approximately 7.1 grams. 9ct yellow and white gold fancy link bracelet, yellow gold three-row brick link sections, with a polished finish, and white gold double-U shaped links, claw set with circular cut cubic zirconia, with lobster clasp. Width 6.3mm, length 7.5 inches. Weight approximately 9.6 grams. This attractive 9ct yellow gold tubular bangle features a diagonal groove pattern both inside and out as well as sprung hinge and a figure-of-eight safety clasp. 9ct yellow gold woven hollow curb link bracelet, with polished finish and trigger clasp. Width 6mm, length 7.5 inches. Weight approximately 3 grams. 9ct yellow gold bracelet with hollow scrolling San Marco links, with plain polished finish and lobster clasp, width 5.7mm, length 7.5 inches. 9ct yellow gold square section Byzantine link bracelet, with polished finish and lobster clasp, width 1.8mm, length 7.5 inches. Weight approximately 3.5 grams. The ten stylised figure-of-eight links in this 9ct gold bracelet each feature a claw set oval emerald (4 x 3mm) and five pavé set diamonds in a fine white gold channel. This bracelet is seven and a half inches long and fastens with a lobster clasp. 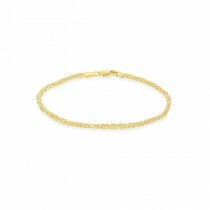 9ct yellow gold fancy link bracelet, twisted curb links, with bolt-ring clasp, width 2mm, length 7 inches. Weight approximately 1.4 grams. 9ct yellow gold bracelet, composed of fancy oval flat links, with bolt-ring clasp, width 3mm, length 7.5 inches. Weight approximately 1.9 grams. 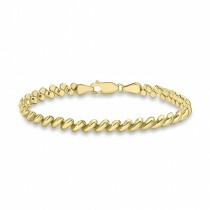 9ct yellow gold diamond cut hollow rope chain link bracelet, with lobster clasp, width 2mm, length 7.5 inches. 9ct yellow gold Marine link bracelet, with lobster clasp, width 3.3mm, length 7.5 inches. Weight approximately 1.7 grams. 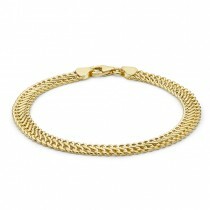 9ct yellow gold Spiga link chain bracelet, with lobster clasp, width 3mm, length 7.5 inches. Weight approximately 2.8 grams. 9ct yellow gold 4mm Celtic link 7 inch bracelet with lobster clasp fastening measuring 7 inches. Weight approximately 4.4 grams.